Today, I learned how to ride a bike. You may recall that this was one of my New Year's resolutions, and I am proud to say that I can check it off my list! Class met at REI in Berkeley at 9:45am, where we piled into the REI Outdoor School van and drove to the El Cerrito DMV parking lot. The parking lot has a driveway with a (very) slight incline, which allowed us to get a little speed without having the instructors run along behind, pushing your bike. You know, like your mom or dad probably did when you learned how to ride as a kid. For the first few hours (the class was 4 hours long), we rode our bikes without pedals, our seats low enough so our feet could rest flat on the ground. We started at the top of the incline with a bit of a walking/running start, and just sort of coasted down as far as we could go without stopping. The instructors called this "gliding". We practiced gliding until we could get all the way down the incline without stopping; then we practiced continuing with a right-hand turn and coasting through the parking lot down to where the van was parked. I'd say the whole stretch from the incline to the van was a couple hundred feet? I am bad at guessing these sorts of things. 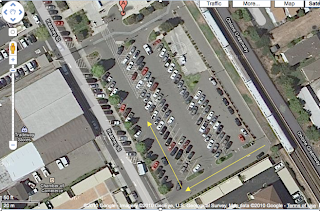 Here's a map of the parking lot, with the path marked in yellow arrows (click to enlarge). Once we had become comfortable gliding through the yellow-arrow path without stopping three or four times in a row, our seats were raised about an inch. This repeated until our seats were raised to their full, pedal-ready height. This is the height at which you are kind of on tip-toe when you put your feet down. This is incredibly awkward for getting on and off the bike if you are not used to it. Just sayin'. Anyway, I was ready for pedals around 12pm - an hour ahead of schedule, according to the instructor! I was pretty stoked about it; at the beginning of the day, I had no idea how I would do. Turns out, I found the gliding to be pretty easy, and my balance was better than I thought it would be. By the time the instructors said I could move on to pedals, I was ready! I walked my bike to the top of the incline, glided down, turned right, and placed my feet on the pedals. In just a few seconds, I was riding! I pedaled my way all the way back to the top of the incline! Such freedom! I think the best moment of discovery for me was when I was at the top of the incline and had a runny nose. My tissues were all the way back in the van...but I realized I could ride my bike over there in about 10 seconds! Thrilling! I know it's silly and small, but it was a big deal to me to realize that now I can just jump on a bike and get where I need to go. I will have to learn how to ride in traffic/urban areas, and perhaps how to ride on uneven terrain as well, but I feel confident in my ability to do so. Let me restate: I Can Ride A Bike. For someone who has spent the greater part of her adult life feeling left out from this particular part of society, this is a big deal. I highly recommend this class to anyone who is hesitant to hop on a bike. REI instructors really know what they are talking about, and this particular method of teaching was very successful. After having learned this way (starting with no pedals), I feel like the whole training wheels method is sort of backwards and counter-intuitive. I mean, why start someone on four wheels if you are only going to take two of them away eventually? That way, you don't learn the real balancing thing, since you have the crutch of the training wheels. This makes so much more sense to me...to the adult me anyway. Start off learning how to balance and turn on the bike, just going down a slight incline. Then, once you have control of the bike, add the pedals. I could not believe how simple and fun it was, and I am just so glad that now I can join the rest of the bike-riding world! And now, a short video of my "Victory Lap". We each did one at the end of the class, at whatever level we had reached by the end of the lesson. For some, this was simply gliding, sans-pedals, all the way to the van. For some, this was gliding and then pedaling back to the starting point. For me and one other woman, this was biking down and then weaving through the cone course the instructors had set up for us. I cannot believe that I went from not being able to ride a bike to doing a difficult cone course in under four hours, but I did it! As you can hear in the video, the instructor was proud of me - and I was proud of myself too! Woooooooo! You're a super star! A super star! Wooooooo!! When my dad took the training wheels off my pink princess bike I threw a fit the whole neighborhood remembers. And then I refused to ride a bike ever again. Fast forward a few years. I'm ten. I've just booked my first TV role because I'm a kid who can ride a bike. Even though I can't. I have to be able to ride a bike the day after tomorrow or else they'll fire me. My mom lets me stay home from school and even though she's never ridden a bike in her life, she teaches me how to ride my bike without training wheels, we practice all day, and I shoot the next day without incident. Damn straight. Frost - That is a great story. I love when actors learn new skills for roles; I would think this is one of the coolest things about the profession. Love this! Way to go, Kim! You make a great point about not starting with four wheels. It's too late for me to change that for my little guy, but it totally makes sense. Kudos to you! Thanks, Penelope. The instructor also said it's much easier to learn as a kid. His exact words: "Put a kid on a bike and he'll learn to ride it." Kids are much closer to the ground and have much less built-in fear. That whole no-pedals thing is also being used for kids these days. You can buy an Actual Product called a glider-bike or some such, and it's like a bike that will never have pedals. Lets the kids learn balance first, before the whole pedalling thing. Yeah, Jennifer, the instructors told us about that! They actually sell them at REI - little wooden things. Apparently kids as young as 1 year can use them! Kim, I meant to say: GO YOU!!!! YAY KIM!!!!!! I'm so proud of you. Let's go mountain biking next time you come down! Woohooo!!! Hey Kim! I just now read the entry! (need to use Google Reader more often), but congrats! I'm proud of you! It took me a while to learn how to ride a bike as well; from like elementary through high school I never rode one. Thanks, Cliff! If only I had learned how when I worked at Goog, think of how many bike rides to Crittenden I could have taken to burn off your ice cream!